Project Atomic will be participating in Google Summer of Code for the first time this year. So if you are a student, consider spending your summer (or winter in the Southern hemisphere) hacking on container technology. If you know a student, encourage them to apply. We are participating as part of Fedora, so specifically we’re looking for work on any or all of the projects which are part of Fedora Atomic Host. We have a list of ideas on our GSOC Page, and more detail on the Fedora GSOC Ideas wiki page. But, of course, you may have even better ideas for an interesting project! Since Atomic App has released version 0.4.2, I decided it was past time to make the atomic-site into an Atomic App instead of using a shell script that wraps Docker to test it. The new setup is a big improvement, and a useful guide to Nuleculizing your own apps. As you know, the purpose of Atomic App and Nulecule is to give you a provider-agnostic way to specify multi-container applications and orchestration metadata that stays with the application image(s). Eventually, this will allow for single-command deploys of even large, scalable apps involving many containers. For now, it enables us get rid of some hackish shell scripting around Docker in our atomic-site test setup. I’m going to begin our video series here on the Project Atomic blog with a video of my presentation from KubeCon 2016, Full Automatic Database. This presentation explains the design of a prototype high availability version of PostgreSQL, using Kubernetes on Atomic Host. This week was the Fedora Cloud Working Group’s Activity Day (FAD), where a dozen of us got together to work on the project’s adoption and innovation in the public and private cloud sectors. Discussions and decisions there covered a range of topics, including Fedora Atomic Host, public cloud images, Vagrant improvements, and automated testing of cloud base images, Atomic and container images. You’ll be seeing a bunch of changes resulting from this over the coming months. One topic came up which is going to pretty much eat my time for at least a week, though: we don’t yet have a working, easy-to-deploy download of OpenShift Origin on Fedora Atomic Host. Clearly, we need to fix this; my goal is to have something working by this time next week, for DockerCon. 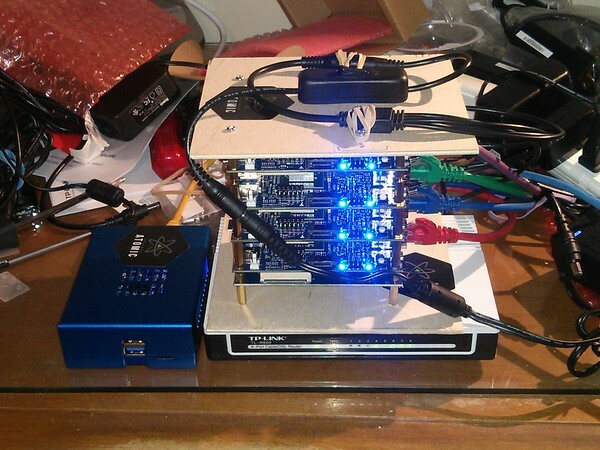 I’m continuing to kit out the Sub-Atomic Cluster, in the process it’s received some upgrades. Thanks to John Hawley of the Minnowboard Project at Intel, I now have a nice power supply instead of the tangle of power strips, and in a couple days I’ll also have more SSD storage. You can see here that one node is in a nice blue metal case: that’s Muon, which we’ll be raffling off at DockerCon. Come by booth G14 to see the cluster and for a chance to win the Muon! 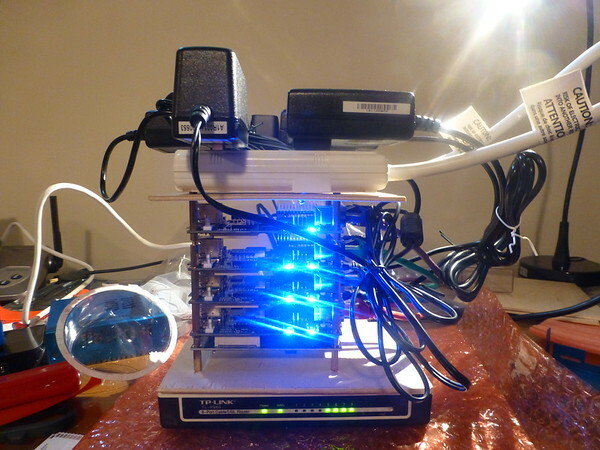 While I’m waiting for those, though, I might as well get this set up as a proper Kubernetes cluster. Ansible is my tool for doing this. Look, new case! 3D printed, thanks to Spot Callaway. In my previous install of the Subatomic Cluster, I simply did the manual Ananconda install. However, since this cluster is for testing, I wanted a way to re-install it rapidly so that I can test out various builds of Atomic. This time, I was installing CentOS Atomic so that I could test things out on CentOS Atomic Continuous. If you’re at either event, drop by the booth or table and say hello! TL;DR: If you are a production user of Kubernetes on Fedora Atomic Host, you can now upgrade to Fedora Atomic Host 25. Kubernetes 1.4 is part of the base image now. The latest Fedora Atomic Host bi-weekly release now available. Per the prior Fedora Atomic blog post, OSTree updates and biweekly releases are now fully synchronized. We have also added latest links to make downloading the most current version simple. As this release contains a security update, users of Atomic Host are urged to update their systems as soon as they can. It fixes CVE-2017-6074: DCCP double-free vulnerability. The Fedora Atomic Working Group had our second Virtual Fedora Activity Day (VFAD) last Friday in order to resolve a number of issues and policy questions with the Container Guidelines. Our decisions will be of interest to anyone submitting software to the Fedora Layered Image Build Service (FLIBS), as well as anyone who runs their own public open source registry. Among those we discussed were versioning, labeling requirements, help files, volumes and systemd in containers. As well as numerous package updates, this release fixes the space leak from false ref issue. This includes fixes for an rpm-ostree CVE and an etcd bug, as well as new versions of cockpit, kubernetes, and more. This release replaces the scheduled release from last week that was delayed due to a kernel regression. We plan to return to our regularly scheduled release process by performing a release next week as well. This release is only a week after the last release, because we are returning to our regular release schedule. It also fixes CVE-2017-5461, a critical vulnerability in NSS, so all users should upgrade their hosts and container base images as soon as reasonable. Going to the Red Hat Summit? Project Atomic will be there — come see us! We’ll have a microcluster, and demos, and a BOF, and other stuff. One of the major benefits of the overlay2 filesystem for Docker is that you no longer need to have a separate storage volume for your Docker containers, images and volumes. This means that you don’t need to try to decide how much free space you need in the root FS as opposed to how much you need for containers; you can just create one big volume to fill up the disk. Since overlay2 is fairly new, though, we’ve chosen to install a separate Docker volume by default on Fedora 26 Atomic Host. This lets users switch back to devicemapper if they run into some kind of issue with overlay2. However, if you’re installing a new dev system, you might want the ease-of-management of having one big volume. Unfortunately we had some release engineering hiccups last week. Which caused us to not have a release candidate with all the fixes we needed until Friday. We will get back on track next week. Notable updates are the atomic CLI, ostree and rpm-ostree. This release returns us to our normal 2-week schedule after some delays with the last two releases. Notable updates are the kernel, ostree, and selinux-policy. Notable updates are the kernel, systemd, bubblewrap, and runc. This release contains fixes for two security issues. Users are urged to upgrade promptly. IMPORTANT: This release of Fedora 25 Atomic Host will be our final release based on Fedora 25. We will start releasing Fedora 26-based Atomic Hosts from this point forward. Information about Fedora Atomic Host upgrade policy can be found in Fedora Magazine. We’re all very excited about the steps forward Atomic Host is taking with this major release. We hope you’re just as excited to try them. Read on for information about software, upgrading, and more. As you know, I’m all about installing Atomic on bare metal using kickstarts. And one of the things which has changed with Fedora Atomic 26 is some of the tags and locations you need for your kickstarts. You’ll find that your old kickstarts no longer work. The Fedora Atomic Working Group, a major part of Project Atomic, is changing where to join and participate, including mailing lists, IRC, and where to work on Kubernetes integration. Among other things, the Fedora team is becoming more tightly integrated with the rest of Atomic … and vice-versa. Read on for details. Cockpit 148 has been released, including support for using Cockpit in Internet Explorer. You can read more about it in the Cockpit Blog. There’s been a lot of activity on the CRI-O container runtime project, as well as on their new blog. The big news is the release of the CRI-O 1.0 beta, of course. Let me summarize the rest for the sake of those catching up with the project. Since Project Atomic has now spread out across several blogs and websites, this is the second of what will become regular updates on events and posts around the Atomic community. This is also a useful catch-up for anyone who doesn’t have time to backfill on all of the individual blog posts. This week includes kpod, vagrant-buildah, Fedora Atomic Host, CentOS Atomic Host, Kubernetes containers, and more. This year’s Flock to Fedora contributor conference is chock-full of Atomic project work. If you’re interested in Atomic Host, containers, and Kubernetes, you’ll have plenty to do for the whole week in Cape Cod. Sessions will cover maintaining containers, writing docs, the FLIBS build system, building alternate-arch containers, and much more. And if you’re in the Boston area … there’s still time to register! Read through for a list of sessions. The Fedora Atomic WG and Fedora Release Engineering teams have updated the Fedora Layered Image Registry. With this latest release, images based on Fedora 26 are now available, in addition to the images which were already available based on Fedora 25. This update also includes fedora-minimal images for all active releases, each containing a stripped-down version of Fedora at about 100MB in size. This release mostly includes routine updates to packages. Highlighted updates include a new kernel, runc, and container-storage-setup. During testing for this release we found an isolated hardware issue. This mostly affects the minnowboard hardware platform. One of main features of Atomic Host is the ability to roll back bad updates. This includes bad kernel updates. Since Fedora Atomic Host follows Linux kernel releases fairly closely, we’ve seen a few of these, such as the one which took out my Minnowboard test cluster on August 20. The most notable changes in this release are a new version of the kernel, kubernetes, rpm-ostree and dnsmasq. The dnsmasq update fixes quite a few CVEs. Click through for a complete list. Project Atomic contributors and projects will be represented at many events in October. If you’re coming to any of these events, drop by and say hello! All Things Open: Charlie Drage will be presenting Kompose: Going from Docker Compose to Kubernetes and Beyond. It’s likely that he and Dusty Mabe will also be around the Red Hat booth; drop by. This release of Fedora 26 Atomic Host will be our last Fedora 26 based release. We will start releasing Fedora 27 based Atomic Hosts from this point forward. The most notable changes in this release are a new version of the kernel and ostree. The Fedora Atomic Working Group needs your help to decide how Docker will be included in Fedora Atomic Host in the future. If you’re already familiar with this issue, you can skip straight to the survey. Otherwise, read on for some background. Fedora 27 Atomic Host is now available. Highlights of this version include multi-architecture support, containerized Kubernetes, a single OverlayFS volume by default, and new OSTree layering capabilities. Over the next week or so, we will have additional posts on each of these features, giving technical details and use-cases. But today, for the release, we’ll have quick summary of the major changes. Going to KubeCon? Contributors from Project Atomic, OpenShift Origin, and other related projects will be all over the conference, including talks, salons, and a whole schedule of back-to-back demos in the Red Hat booth. Read on for details on what to see at Kubecon. This is a large update as it is the first update in Fedora 27. Included are new kernel, systemd, ostree, rpm-ostree, and atomic CLI. Future updates should be quite a bit smaller than this. This is the 3rd release of Fedora 27 Atomic Host, including mulit-architecture artifacts. It includes a new kernel (4.13->4.14), rpm-ostree, and atomic CLI. Coming to Red Hat Summit? Project Atomic will be there! We will have multiple sessions plus demonstrations at the booth in Community Central. Click through for details.